Perfect Keto Base Exogenous Ketones and MCT Oil Powder available from Keto Supplements - Bringing you the latest products to support your ketogenic lifestyle. 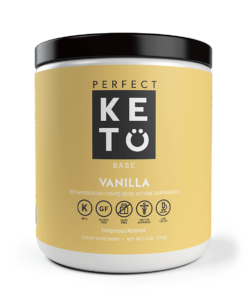 Perfect Keto Base is a beta-hydroxybutyrate powder that helps get you into ketosis instantly. If you need help choosing your supplements, please don’t hesitate to contact us. Perfect Keto Base comes in five amazing flavors: salted caramel, chocolate sea salt, vanilla, coffee and peaches & cream. Gone are the days of “jet fuel” tasting ketones. These two flavors are so delicious you will actually enjoy getting into ketosis. How do you use Exogenous Ketone Base?